When you click ‘’CC:’’ in your email window, you send a virtual ‘’carbon copy.’’ This abbreviation is a relic of a nearly-bygone era, as digital technologies eliminate the need for carbon paper. Indeed, there is only one remaining manufacturer of carbon paper in the United Kingdom. But with carbon paper on its way out, the Bodleian has an early copying technology on its way in. The manifold writer, including several styli and a notebook. Bodleian Libraries, Oxford University. The pen included in the manifold writer set. Bodleian Libraries, University of Oxford. The object to be attained by the use of the above inventions (when used together) is, to produce two or more impressions by one effort in writing, which is thus performed: Take a plate made of tin (called a tablet) or other hard thin substance, the full size of, and place it under, the writing paper; then place a sheet of the inked paper or composition between every sheet of paper to be written or impressed on, observing to place that side downwards which has been smeared over; then place a small plane or piece of flat wood upon the whole, for the purpose of resting the hand on, and which will confine the papers in their proper situations, and prevent the under papers from receiving improper marks. A sufficient quantity of common writing ink being put into the cavity or tube of the pen, proceed to write, and the ink flowing from the point of the tube, will give one impression, and the other impression or impressions will be formed on the under sheet or sheets from the inked paper or composition. The impression on the under sheet or sheets are clearest and best made on thin wove writing paper, and by a hard pressure of the instrument or pen. The label on the copying book in the Bodleian’s new acquisition may mark this as a slightly later version of Folsch and Howard’s technology. This method of taking copies by the means of blackened paper has long been noticed, and we think that more than one impression at a time will be hardly legible. ”Long’’ is a relative term, but the ‘’blackened paper’’ method of taking copies – the earliest version of carbon paper – did indeed precede Folsch and Howard’s 1809 patent. In fact, the invention of carbon paper is typically attributed to Ralph Wedgwood, who patented his ‘’apparatus for producing duplicates of writing’’ in 1806. Also known as a ‘’Noctograph’’, or a ‘’Manifold Stylographic Writer’’, Wedgwood’s device was invented to aid the blind in writing. Wedgwood’s basic technique involved sandwiching ‘’carbonated’’ paper (made by soaking paper in printer’s ink) between writing paper (on the bottom) and thin ‘’duplicate paper’’ (on the top). When a stylus was used to write on the top layer, the text was impressed on the regular paper and on the duplicate paper in reverse. Because the duplicate paper was particularly thin, the text could be read through it. Wedgwood claimed that up to 6 impressions could be made at once, if the technique was properly applied. The Advantages of R. Wedgewood’s improved Stylographic manifold Writer, or as it is commonly called Copying Machine have been found so much beyond as entirely to Supersede all the former Improvements of that kind. It is used now in most public Offices but particularly in the Office of State for foreign Affairs where as you must so well know the utmost secrecy is often indispensable. the method is so new to me that I am as yet awkward with it. it is not pleasant in it’s use, and I think will not take the place of the Polygraph. where I want but one copy, which is 99 times in an hundred, I shall use the Polygraph, & reserve the Stylograph for cases where more than one copy is wanting, tho’ I have not yet tried it in that way. further trial of the Stylograph convinces me it can never take the place of the Polygraph but with travellers, as it is so much more portable. the fetid smell of the copying paper would render a room pestiferous, if filled with presses of such papers. You will have perceived that I have been writing in the dark, – & if you look close enough may see that I am not using pen & ink, – but a very excellent contrivance called the double writer, which is liable to no other inconvenience than that of the paper shifting, – as I see this has done in the last page. The machine, instrument, or pen, is made of glass, enamel, or any sort of stone, or metal, through which a hold can be made or formed. The tube or hole at the point of the instrument or pen is very small, but becomes larger a trifling distance therefrom, and is calculated to contain a much greater quantity of ink than common writing pens: the instrument or pen is polished at the point in the usual way. But despite Folsch’s embrace of ink, and manufacturers’ emphasis on portability and secrecy, manifold copiers – which is to say the carbon paper process – was slow to catch on. The Associated Press was among early adopters, using carbon paper for reporting as early as the 1820s. But the carbon-copy approach didn’t take off until the 1870s, with the invention of typewriters (and a far less messy carbon paper-making process). With this history of manifold writers in mind, and given that the book of blank paper is labelled ‘’F. Folsch, Inventor and Patentee of Improved Manifold Writers, 327 Oxford Street, London,” it’s reasonable to conclude that the artefact just acquired by the Bodleian is a Folsch product. Notably missing from the case, however, is the pen described above. The pen that Folsch patented in 1809 is considered one of the first examples of the fountain pen. There had been previous efforts to create pens with their own ink supplies, even as early as the seventeenth century, as we can see in the diary of Samuel Pepys, in which he mentions a ‘’Silver pen[…] to carry inke in.’’ But fountain pens were not made in any large numbers until the end of the nineteenth century, when a reliable construction was patented by L.E. Waterman. The metal pen with the Mitchell nib may be a later substitution for the Folsch pen. On the other hand, it may be a sign that the manifold writer has a slightly more complicated history. Indeed, further questions were raised when we discovered another manifold writer c. 1820 that looks remarkably similar to the one now owned by the Bodleian. 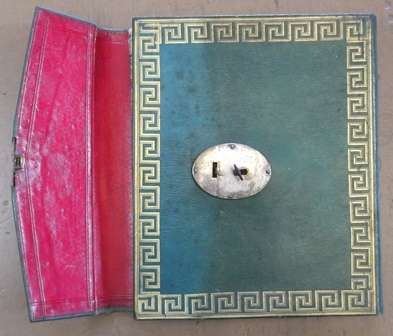 This second manifold writer has the same green binding, Greek key decoration, red morocco interior, and key lock. 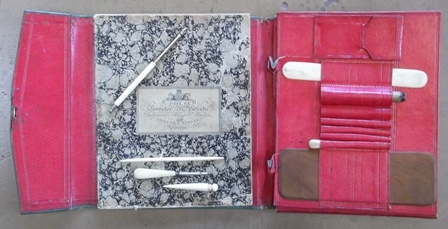 The insert with slots for tools is missing, as are the tools themselves; otherwise the two manifold writers seem clearly to be siblings—except for one thing: instead of a notebook with Folsch’s information on it, this manifold writer includes papers attributing it to Ralph Wedgwood of ‘’328 Oxford Street.’’ W.B. Proudfoot’s description of Wedgwood’s manifold writer lines up with these details: two books of special papers (transparent papers and carbon papers) were ‘’housed in a handsome folder containing several styles or styli (some agate tipped), a black lacquered metal writing plate, and some good-quality writing paper’’ (26). This left us with two very similar manifold writers, and two consecutive addresses on Oxford Street. The Folsch notebook locates him at 327 Oxford Street, while Ralph Wedgwood made and sold his ‘’Improved Manifold Writers & Penna-Polygraphs’’ at 328 Oxford Street. The New Street—On Friday a Special Jury was summoned upon a Warrant of Inquiry before William Toort, Esq. the Deputy High Bailiff for the City and Liberty of Westminster, in the Guildhall, to assess what damages should be awarded to Mr. Frederick Bartholomew Folsch, for the loss of his premises, Nos. 327 and 328,’Oxford-street. Mr, Serjeant Pell, on behalf of the claimant, stated his case at some length, and called several witnesses to prove the value of the premises. Mr. Harrison addressed the Jury in a very long, able, and eloquent speech, against the demand which the claimant made, which was jG 10, 078. The Deputy High Bailiff recapitulated the evidence and the Jury found for the claimant—Damages, £1400. This suggests that in 1816, Folsch owned both 327 and 328 Oxford Street. Had he gone into business with Wedgwood, or perhaps acquired the property from him? 1) Wedgwood and Folsch were working together. Both men patented versions of the manifold writer in quick succession, and if they were indeed working in such close proximity they may have collaborated. 2) The Bodleian has acquired a Wedgwood manifold writer with a Folsch notebook inside of it. The notebook is not attached to the manifold writer, and may have been added to it. This would mean that the set is in fact composed of part from two separate manifold writers. These few options by no means exhaust the possibilities, and we are continuing our research into the origins of this fascinating artefact. The closed manifold writer, seen from the side. Bodleian Libraries, Oxford University. This investigation is part of a larger thought-project exploring the legacy of ‘’copying’’ at the Bodleian. Related objects in the Bodleian’s Special Collections include William Godwin’s ‘’wet transfer’’ copies, made using James Watts’ letter press technology. Proudfoot, W.B. The Origin of Stencil Duplicating. London: Century Benham, 1972. Print. Rhodes, Barbara, and William Wells Streeter. Before Photocopying: The Art & History of Mechanical copying, 1780-1938. New Castle, DE: Oak Knoll Press; Northampton, MA: Herald Bindery, 1999. Print.